Mosaics is one of the oldest of art forms. It is a medium that has been used since the fourth millennium BC to decorate and express the needs and feelings of people in a wide variety of ways. A mosaic is a work made up of cut fragments that are assembled together to form a recognisable image or abstract design. From ancient beginnings, mosaic has continued to combine the practical with the beautiful – from decorated floors, walls and furniture, to ritualistic masks and shields, to embellishments for domestic, commercial and industrial environments. Worldwide, artists are using mosaics for their self-expression and when used with instinctive perception, is an unsurpassable medium in the creation of a work of infinite inspiration. It is a wonderful medium and can utilise both the simplest and the most luxurious of materials, from stones, pebbles, glass, ceramics to precious stones and gold. It has always held a fascination for people and its versatile nature can be adapted to a wide range of needs. Practical, beautiful, forceful, enduring, awesome – it can be all these things but above all it holds the power to inspire admiration and imitation. A wide variety of materials can be utilised in creating mosaics. These may include precious materials such as gold and hand-made glass called smalti; natural materials like stone, marble, pebbles, shell and mother of pearl, and manufactured materials like china, glass and tile. Whatever the material chosen, each comes with unique properties of colour, texture and finish. A number of special tools are used in mosaic making to cut the materials used to provide the shapes required – a hammer and hardie is the traditional cutting tool for mosaicists, whereas nippers and wheeled glass cutters are the modern cutting tool. Whatever material and design technique chosen, the end product will always be tactile, fascinating and inspiring! Sarah Stanley is a professional and experienced mosaicist, based in her studio on Johnstone’s Island in Brentford. From her waterside studio, she produces original contemporary mosaics for interiors and outside spaces. Unique balls, plates, bowls and panels are her trademark, handmade using glass, porcelain, marble, stone and ceramic. She also exhibits regularly in London and the South East and teaches adult classes and weekend workshops. Wendy Freeman is a mosaic artist and printmaker who uses many materials, including ceramic tiles, to create her diverse work. Her work demonstrates a love of design, shape and colour. She teaches on weekend workshops with Sarah Stanley. Rosanna Henderson is a self-taught artist working from her immaculate studio at home in Ealing. 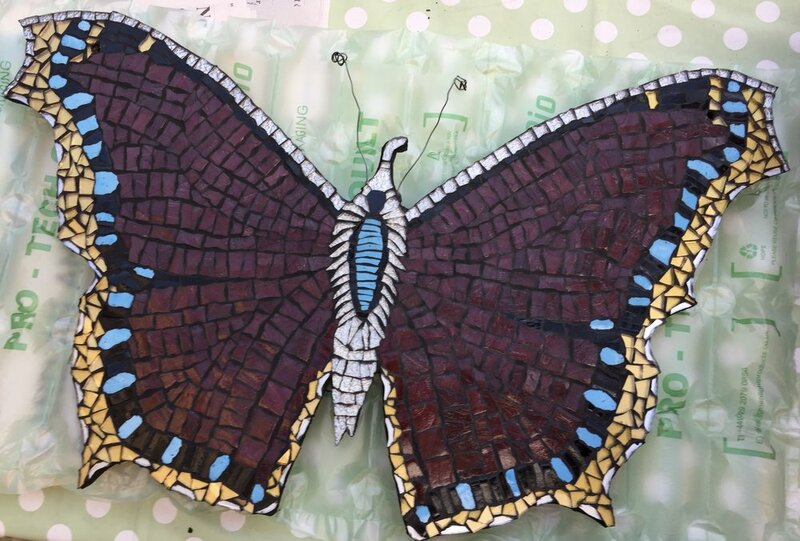 Rosanna uses a wide range of materials but particularly likes working with unglazed ceramic tiles, creating a variety of wall hangings and items for the garden, she runs regular beginners’ day-workshops. Kitty Hartnell is also a self-taught mosaicist and has run drop-in mosaic sessions in her home in Ealing for over 15 years. She also offers occasional weekend sessions in Dorset. She works in a wide variety of mediums and enjoys creating colourful garden pieces from ceramic tiles focussing on plant forms, as well as incorporating hand-made ceramic and glass pieces in her work. She loves experimenting with different designs and forms, calling upon her interest in natures forms. Edda Dirks was inspired by visiting BEAT to take up mosaicing and now produces a variety of pieces, often based on geometric designs under the name of Kaleidoscope Mosaics. She not only decorates wall panels but also pieces of furniture such as table tops. If you are interested in finding out more about mosaics why not plan a mosaic trail during this year’s BEAT?